This glossy 90-page magazine-format publication has something of interest for everyone, being up to the usual high standard of G2 Publishing. The Glorious Ashes has nine chapters, comprising Introduction, Birth of The Urn, The Golden Age, Between The Wars, From Bradman to Benaud, The Urn in the Balance, From Botham to Warne, The Ashes Rekindled and The History Boys. The Glorious Ashes traces the history of Anglo-Australian rivalry back to the days of Grace and Spofforth, and the great Test match of 1882 in which both men took part. And it brings the legend right up to date with an in-depth review of each of the last two series. 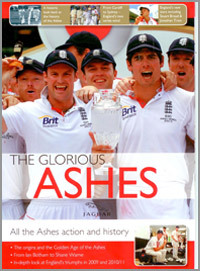 In the introductory chapter, the writers say that "the stories of each game of the 2009 and 2011 series are told here, after a foray into the long and distngished history of cricket's greatest rivalry, that concerns a small, fragile urn kept on display in the museum at Lord's Cricket Ground. It is a rivalry that spans three centuries, and has invoved many legendary cricketers. It has also produced Test cricket, on occasion, of almost umimaginably high quality, and shows not the slightest sign of lessening in its intensity." From the arrival of the tiny urn more than 120 years ago, the Ashes have remained amongst the most coveted prizes in world sport. Australia has held sway over England over much of the recent past, but the tide has now turned. In one of the greatest series ever, the Ashes returned to England in 2005 and then at a packed and sunlit Oval on 23 August 2009, they came back again. But was the greatest task, winning the urn on Australian soil - one not achieved for 24 years - beyond England's current side? Not a bit of it. An emphatic 3-1 series triumph saw Andrew Strauss' supremely drilled and gifted side walk away with the ultimate prize. A few English players have established themselves as serious international cricketers and any nation that beats Australia is capable of doing more, so long as it does not get carried away. The writers say that the scene moves on to England again in 2013, when Andrew Strauss and his men will be conident of making it three series wins out of three. This is a fascinating magazine, having excellent photographs and pleasantly produced. What is most remarkable is that so much has been packed into a magazine of 90 pages, with everything set out with such clarity of detail.